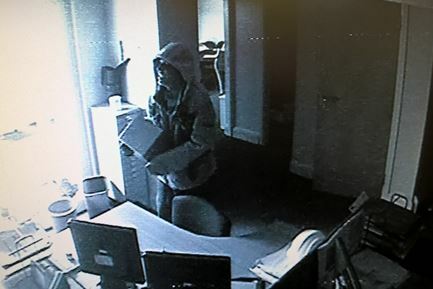 These CCTV images show two people inside the property in hooded clothing. However, it is believed three people entered and helped themselves to thousands of pounds cash, 10 laptops and other computer equipment, plus copper piping and trainers. 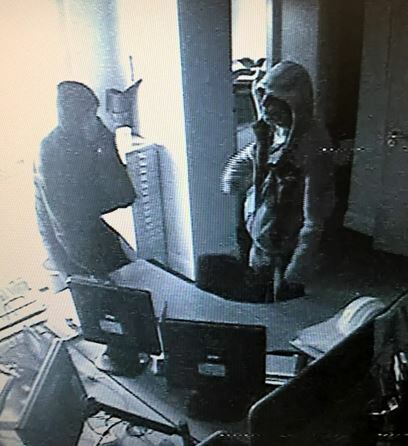 The group are believed to have entered the premises just after 9.30pm on Sunday 3 March. They go in and out of the building several times until 2.28am on Monday 4 March. We would like to appeal to those who saw anyone suspicious that night to get in contact with us. An estimated between £2000 and £3000 cash was taken also. 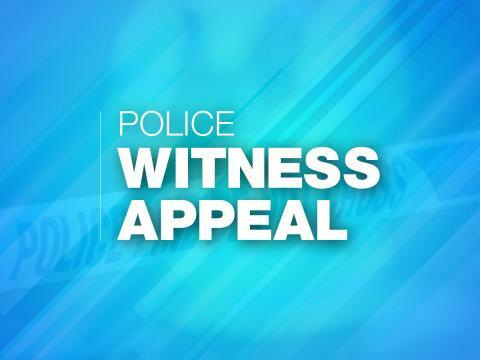 Although facial features cannot be made out in the CCTV images, it is believed one man was wearing a khaki hoody or jacket, one was in a dark top and camouflage tracksuit bottoms or trousers and the other in a black hooded top with Nike Air trainers. Anyone with information is asked to call 101 and quote 44190076311. If you have any information, please contact us on 101, quoting reference number 44190076311.